The Salvation Army’s Red Kettles are a cherished symbol of Christmas. While need doesn’t change, the times do! Not everyone carries cash to donate when they see a Red Kettle, even if they want to. 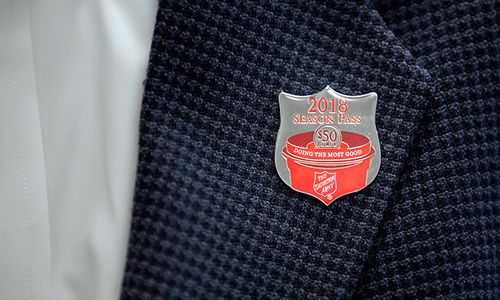 Our Season Pass Pin makes it super-easy to support The Salvation Army at Christmas, even if you aren’t carrying cash in your pocket. Show the pin and get a “pass” from your kettle donation along with a sincere “thank you” from the bell ringer. See – told you it was easy!. Make a one-time donation* of $20, $50 or $100, and we’ll send you your Season Pass Pin to wear on your coat or jacket this holiday season. *A $3.50 charge will be added to each transaction to account for shipping charges. Thank You for supporting The Salvation Army of Kent County!